Just before Dallas Clark of the Colts ran into Matt. Dallas was shaken up on the play. Dallas was later over heard saying "that camera guy hits like a ton of bricks!" To be a good sports photographer or photojournalist, you have to get close to the action. Photographers have –-- to borrow the title of Rod Mar's wonderful column in the Seattle Times --- "The Best Seat In The House". But that best seat can be the most dangerous one too. Whether it's Mickey Pfleger getting bowled over on the sidelines by Chiefs' tight end Tony Gonzalez (http://www.sportsshooter.com/news/507) or Johnny Iacono getting smashed in the face by a baseball in a photo box (http://www.sportsshooter.com/news/248) or Mark J. Terrill getting a busted nose after being smacked on the baseline of an NBA Playoff game … whether we know it or not our best seat is often inches away from a workman’s comp claim. At the recent San Diego Chargers – Indianapolis Colts game at Qualcomm Stadium I was once again reminded about the dangers we face and often take for granted when covering sports. At the end of the 3rd quarter, unbeknownst to me, my good friend and Sports Shooter Academy co-founder Matt Brown was run over by the Colts’ Dallas Clark. It happened so fast, I didn’t even see it and didn’t even know about it until I read about it in the photo workroom on the SportsShooter.com Message Board! Apparently the “hit” was a game highlight and was replayed over and over on ESPN (I don’t know whether this says more about the nature of video clip selection at ESPN or how bad this game really was). "It was the last play before the end of the 3rd quarter," Matt recalled a few days later, "Manning was in the shotgun and the line opened up as he throws to his right. 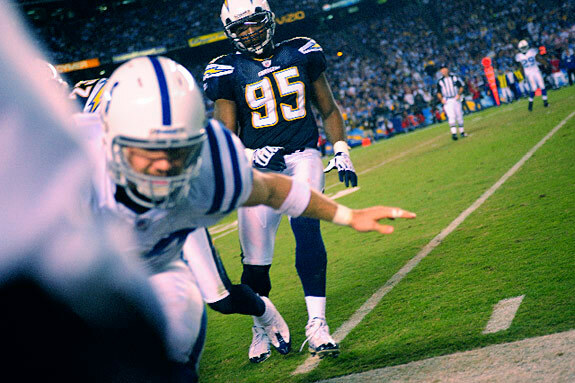 Dallas Clark makes the catch as gets pushed by Chargers Shaun Phillips out of bounds. "As Dallas made the catch I went to the 28-70 around my neck --- I got three frames off before making contact with Clark. From throwing the ball to hitting me happened in 2 seconds. The first thing I did was to drop my 400mm on my left side and get down." Because of his experience and quick reaction, Matt escaped without injury, save for the numerous text messages and emails from friends and relatives that saw the play on television --- over and over and over again. "I threw my left shoulder into his legs to keep him off my head and it worked, Matt said, "The fact that Dallas jumped help both of us out." Obviously Dallas Clark is a pro … and so is Matt Brown. While the NFL has done a great job over the past couple of seasons "cleaning up" the sidelines, there are still a lot of people standing around, especially at college games, that really should not be there. These civilians (not working pros or members of the teams) pose not only a danger to themselves but to us and the players. How many civilians do you see on the sidelines of pro and college games clutching a cellphone to their ear, waving stupidly to a TV camera or holding up a camera-phone trying to be a Sports Illustrated photographer? Matt Brown gets hit by Dallas Clark of the Colts during a game at Qualcomm Stadium in San Diego. Do you think these civilians have the wherewithal, reaction time or most of all experience to avoid a collision if a 260-pound linebacker decided to go out of bounds full-speed? I’m surprised we haven't heard more about serious injury to boosters/jock-sniffers/hangers-on that were clobbered on this sideline ---where they really shouldn’t be? This is probably more a tribute to the athleticism of today’s player than just pure luck… how many times have you seen an NBA player running full-out for a loose ball, leap over jewelry-row (aka those expensive courtside seats) and not hurt anyone, including themselves? But while NFL games seem to be getting better on controlling the civilian count on their sidelines --- save that idiotic "Fan Photographer of the Game" ---you know, the one that wins a Rebel camera and gets to "shoot like a pro"? --- colleges seem to be another matter. I know colleges use sideline credentials as a perk, something to give to big-money boosters, celebs, the celebs’ posse and other assorted doctors, dentists and lawyers. But by packing in so many people in a limited space, it not only makes working professional photographers’ jobs that much harder, most of all it is a safety hazard. To them and us. With these civilians basically just hanging out on the sidelines, they block our possible escape route, making us sitting ducks for a possible out of bounds collision with a player or in one instance I saw recently, a referee. Sorry, but get your experience at a prep or JC game! I know I’ve been harping on this topic for years, but after finally seeing a replay of the out of bounds play a couple of days ago, it brought back the reality that we really are in potentially hazardous positions when we’re at most of the games we cover. "I have been hit four times at football games, two at college games and two pro games," Matt said, "Always keep your eyes on the field of play. Always stay alert, try to keep your mind on the game. If you want to shoot the bench or features, back away from the sidelines. Try to avoid turning your back to the field. You never know when a player or players will come." I hope the next "Fan Photographer of the Game" reads Matt’s advice before they shoot a game with their new Rebel and zoom lens … "just like the pros…"
This issue of Sports Shooter features two articles from photographers that have had to deal with the economic plight of the newspaper business: Baron Sekiya after leaving his paper is starting his own news operation in Hawaii and Tim Clayton writes about taking a buyout from his newspaper. It’s that season in So Cal …no not football and not basketball but fire season. Sandy Huffaker writes about covering the recent devastating wildfires in the LA area. Robert Beck checks in with an entertaining and informative article on shooting Sports Illustrated's college basketball preview covers … all SIX of them (I love the ELP reference!). Matthew Mendelsohn contributes another one of his thoughtful writings, this time on getting out of the house on election night and finding some news to cover. George Bridges gives us the lowdown on what you (won’t) see if you’re going to Washington D.C. to shoot the Inaugural. Obviously not afraid of heights, Pouya Dianat writes about how to get to that REALLY high angle. Jared Dort writes about why he should be afraid of heights … and hot air balloons. Doug Murdoch contributes his regular travel column and Myung J. Chun tells us how to get the shakes out of that shaky video clip. And applications are now available for Sports Shooter Academy VI, April 8-12, 2008. Students will really want to apply soon for this wonderful educational event … trust me on that. On the nightstand is Michael Connelly’s latest The Brass Verdict and Generation Kill by Evan Wright. Heavy rotation on iTunes is Up Your Alley by Joan Jett & The Blackhearts and Christmas with Dino by Dean Martin. As always, thanks to Special Advisors & Contributors: Deanna & Emma Hanashiro, Brad Mangin, Rod Mar, Trent Nelson, Jason Burfield, Grover Sanschagrin, Joe Gosen, Paul Myers, Myung J. Chun, Jared Dort and Bob Deutsch. Thanks this month to: Baron Sekiya, Tim Clayton, Matthew Mendelsohn, Robert Beck, Sandy Huffaker, Pouya Dianat and Doug Murdoch.